Our speaker was Dr Payel Das from Oxford University who came to talk to us about "Galactic Archaeology with Gaia". She introduced herself by saying that she is a postdoctoral researcher and she studies the stars of our own home galaxy — the Milky Way. She gathers data on the stars' positions, velocities and chemical composition to understand their formation and evolution. As stars are the building blocks of galaxies this information then allows her to build models of how the galaxy formed, whether there are any signs of past mergers with surrounding galaxies and the resultant growth due to these mergers. She began her talk by saying that a lot of the data she uses to build computer models of galaxies is obtained from the Gaia spacecraft. This is a space-based mission by the European Space Agency that was launched in 2013 and is expected to last until at least 2022. The aim of the mission is to produce the most detailed three-dimensional map to date of stars, planets, comets, and bright galaxies known as quasars. On completion its catalogue will have mapped a billion objects over 70 times so that each can have its precise position and motion recorded. Dr Das then continued by saying that the Milky Way's shape resembles that of a catherine wheel firework. It is classed as a barred spiral galaxy with relatively young blue stars making up is trailing arms. At its centre is a yellow oval bulge of older stars that are connected to the spiral arms via a similar yellow bar of older stars. Most of the stars of the galaxy lie in the arms and centre but there is also a sparse spherical halo of old stars surrounding the disc and central bulge. She then explained that the flat disc of the galaxy appears to be made up of not one but two nested discs. There is a thick disc that contains about 10-20% of the Milky Way's stars and within that a thin disc of the spiral arms pattern. The thick disc also contains much older stars than the thin disc of blue young stars that sweep outwards from the galactic centre in a spiral pattern. 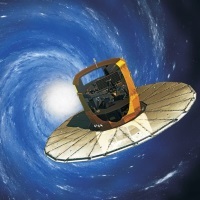 By modelling data from Gaia astronomers have concluded that this thick disc formed when the Milky Way merged with another large galaxy around 10 billion years ago. There are even traces of the merger still apparent, as tens of thousands of stars are still moving in an odd way — along elongated paths contrary to the majority of those in our galaxy, including our own Sun. Further analysis has shown that the incoming galaxy was about the size of one of the Magellanic Clouds, which are the small dwarf galaxies that circle the Milky Way. However, our galaxy was much smaller at the time of the merger and so the gravitational tug of war between each galaxy's merging stars would have been accentuated. Dr Das concluded her talk by saying that she will continue to study the Gaia data to confirm whether these oddly moving stars show that a single merger could be responsible for their behaviour. She commented that some of her latest analyses suggest that it may be more than one merger that is responsible for the stars' strange trajectories.